"Relax! Meditation is easy! Let the mindfulness bell do the work for you!" 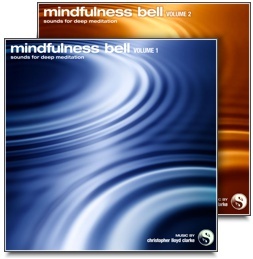 Our Mindfulness Bell recordings are some of our most popular downloads of all time. They are powerful meditation tools that have been created especially for people who want to practice mindfulness meditation. They feature nothing more than the sound of a specially selected meditation bell that is played at periodic intervals to help clear your mind and guide you into a deep state of meditation. These high quality mp3 downloads each includes a 60 minute version for formal meditation practice, and also a separate "5 Minute Mindfulness" recording that's perfect for those times when you just want to clear away mental clutter and get on with your day. These mindfulness bell recordings contains nothing but the pure sound of a Tibetan singing bowl being repeatedly struck with a soft mallet. This calming sound is a wonderful focal point for meditation. Simply absorb your attention in the sound of the mindfulness bell. No mantra is required, no special breathing techniques are needed, just let your awareness be consumed by the sound of the bell. The bell sounds encourages your mind to become still and silent, but alert. This is mindfulness training at its best! There’s something really nice about being able to meditate without having to worry about concentrating intensely or repeating a mantra. Just let the bells do the work for you. Their comforting, meditative sound will help you to anchor your awareness in the present moment so that you can move past mental noise and get in touch with that part of you that is already quiet and still. This really is a very effective way to meditate. If there is one thing I learned while recording the Tibetan Singing Bowls for Mindfulness Bells Volume One and Two, it’s that meditation bells are not all equal! Each and every bell has its own unique sound. Some are quite unmusical, whereas others have harmonics that mingle beautifully. Some oscillate too quickly or in awkward patterns that are distracting, whereas others oscillate with a natural rhythm that is deeply relaxing. Some bells really clang when they are struck, others are too boomy. 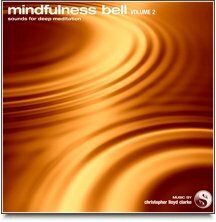 I sampled dozens of different bells and eventually exhausted my own collection of over 65 different bells and meditation bowls before I found the singing bowl with the right sound for Mindfulness Bell Volume 1. Two more years passed before I found the right singing bowl for Volume 2. I am very particular about the sound of the bowls I choose, and I'm also very meticulous when it comes to the recording process. It's easy to underestimate just how much thought and effort goes into "simple" recordings like these. As a music composer and someone who is more than a little obsessed with sound quality, I spent a huge amount of time experimenting with different microphones and recording techniques before I captured the sounds you hear in these recordings. My many years of practicing meditation and composing music for meditation have really helped to attune my senses to what makes a great sounding meditation bell. It is my sincere hope that my dedication to meditation and my meticulous approach to recording has resulted in a sound that will bring you the most relaxing, enriching meditation experience possible. Which is the right Mindfulness Bell for you? Volume 1 is a great all round meditation bell that anyone can enjoy. It's has a perfectly balanced sound that will keep you relatively alert while encouraging feelings of deep relaxation. Volume 2 is more suited to people with a little bit of experience with meditation, or those who have used Mindfulness Bell Volume 1 for at least a few weeks. This bell has a deeper tone and exceptional sustain, and we allow longer periods of silence between each bell strike. It can lead to very deep states of stillness and rest. Having said that, if you listen to the previews and one particular bell really resonates with you, then feel free to ignore the above advice and simply choose whichever volume is the most enjoyable to you. It's also worth mentioning that there is nothing wrong with using both bells from time to time. Sometimes you can go "numb" to the sound of one bell, and so switching to another can help to refocus and refresh your meditation practice. "I have tried various meditation recordings over the years and this one is the best by far. The sound of the bell vibrating into silence and the silences between the sounds becoming longer help to ease one into a deeply meditative state without extraneous words or music. It is perfect for attaining the gap between thoughts, and the gap increases throughout to allow for a deep and rewarding experience. I highly recommend this for anyone interested in meditation and especially for those who need help controlling their monkey minds. Namaste!" "I have looked for quite some time (years) for a recording that was timed, had a clear sound and resonance, and that sounded "real". Great recording, I use it daily, and have had other of my friends, who are counselors, listen to it, and they plan on ordering." "This thing works wonders for me where other mindfulness practices have failed. I've been meditating for over a year now but only by rigidly holding to one thought--say a number or mantra--or inducing trance. Mindfulness seemed esoteric to me and hard to envision. When the bell cleared to silence I could hear all the activity going on around me but without all the preconceived notions of what those sounds pertained to--more like I did as a child. I get it now. The "awareness." Amazing." "I just bought the full version, its amazing, I was victim of the stress on my job and after 3 hours of continuous meditation with this sound playing in the background, I feel like a new man right now, thanks a million!!!" Try out these simple mindfulness exercises. Want to try some mindfulness activities? Follow this link for more. You and your ears can bring mindfulness to life! Try this mindful listening exercise.